For over 10 years the Bedford Business Association has paid tribute to our active military men and women at our annual BBA Trade Fair. This tradition started 11 years ago with a proud army parent asking if we had a space at Trade Fair for the community to write notes to our local military personnel. 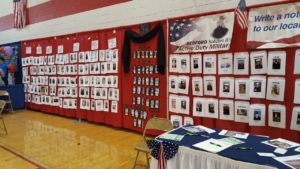 The first year of our military tribute booth, we had 10 service men and women displayed. Now, we have 40 service men and women displayed in the booth. 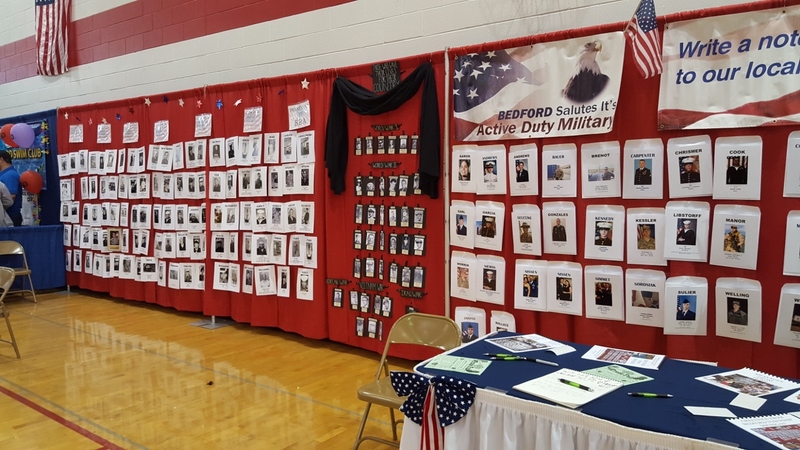 As time went on the BBA decided to expand our military tribute booth to include our many veterans who have defended our country and last year we added a display for those Bedford men and women who died while serving our country. The BBA Trade Fair will be held on March 11 and 12, 2017. We encourage residents to come out to write a note to our active military men and women and to pay tribute to our local veterans. The BBA will be displaying pictures, branch, and rank of those serving in the military. If you have a loved one actively serving our country and you would like to see them recognized, please contact the BBA office. A picture, branch of the service, rank, and a local contact will be needed. Your picture will be scanned and the original will be returned to you. The BBA will also acknowledge all the men and women who have defended and served our country. We have an additional display of veterans in our area who have served our great nation. We need a picture, name, branch of military, rank, and years of service. For more information you can call the BBA office at (734) 850-2200 or email info@bba.org. The BBA office is located at 8204 Secor Road in Lambertville. Questions can also be directed to Dona Folk at (734) 850-6000 along with dropping off pictures at Bedford Public Schools Administration located at 1623 W. Sterns Road, Temperance. An additional drop-off location for pictures and information is Collins Accounting and Tax Service located at 3352 Dean Road, Lambertville.